The big news this week has been the Iditarod Dog Sled Race's decision to move the race start to Fairbanks, which effectively cuts out the first half of the route and redirects dog teams on the Tanana and Yukon rivers all the way to Kaltag, some 650 miles into the Iditarod Trail. It's a big deal for Beat and others in the Iditarod Trail Invitational, which relies on the big-money events — including the Iron Dog smowmachine race — to break and maintain the trail. Without these races, the Iditarod Trail is little more than a loosely linked series of reflective markers affixed to trees, and wooden tripods. Whether or not any trail is actually broken underfoot depends on the whims of local snowmachiners, such as trappers and hunters, who might travel through before the cyclists and runners get there. The Iditarod races were set to follow the southern route this year. After the dog sled race's announcement, the ITI made the quick decision to instead send racers on the northern route, which is at least used by Iron Dog (the snowmachiners leave on February 21. The ITI starts March 1.) The runners and cyclists will reconnect with the dog sled route on the Yukon River in Ruby, shortly before the dogs veer off the river to take a spur to the north that extends their race to a full thousand-mile distance. It will be the goal of ITI racers to *not* take this 200-mile spur, and also to avoid five miles of open river that the Iron Dog will detour around on a longer inland trail. Even in the first 350 miles, there is still Rainy Pass and a large segment of the Farewell Burn that are rarely traveled, and Iron Dog bypasses Rainy altogether. This places all the trailbreaking load — including slashing brush, moving deadfall, and building ice bridges — on the ITI and its grassroots race budget. If there's bad weather, Rainy Pass might not be broken at all, and it sounds like conditions on the western side of the Alaska Range are even more rugged than last year. Beat of course is extremely excited at the prospect of an even higher "wilderness factor" than recent years. I wonder if he's already forgotten what it's like to break trail through hip-deep snow — which he has done, among many other grueling tasks where forward motion is hardly a given. But if there is one constant of the Iditarod Trail, it's that you can't count on anything. These Iditarod decisions don't really affect my plans to ride from Unalakleet to Nome starting on March 15. The dogs will still go through that region at roughly the same time — I planned my window so, hopefully, the bulk of the dog teams will be ahead, as well as most of the cyclists, and the runners will be somewhere close behind. I'm still moving forward with prep for this trip: Reading through trail notes, mulling potential stopping points, planning two post office drop boxes, fretting over long-term weather reports and gear. My trip is nearly a month away, but there's still plenty to fret about. The dog sled race is moving north because, even more so than last year, there are long sections of the route with no snow cover at all. Now that the Polar Vortex has moved in, pushing Arctic air into the eastern side of the continent, Alaska is undergoing another extended thaw. Last year, Beat and I discussed this changing weather pattern and the implications it might have for future Iditarod ventures. Of course he doesn't have weather forecasting expertise or a crystal ball, but he predicted a lot of has ended up happening: late snow, the dog sled race abandoning the Iditarod Trail, and a persistent stretch of above-freezing temperatures and rain in February. If Polar Vortex becomes an annual pattern, this could be the new norm across the wintry places of the West — low snow, extended thaws punctuated by deep cold snaps, more volatile storms and less predictable weather. What this means for California is winter passing us by altogether. Endless summer, for real. Sure, we might still see an increase in pineapple express storms, which will help temper the almost complete loss of snowpack in the Sierras. But the people and plants are still going to bake and burn under year-round summer temperatures. I try to seek comfort from this unsettling notion by imagining that Beat and I make our escape to Alaska before it gets really bad, but this might not happen "B4ITMELTS." 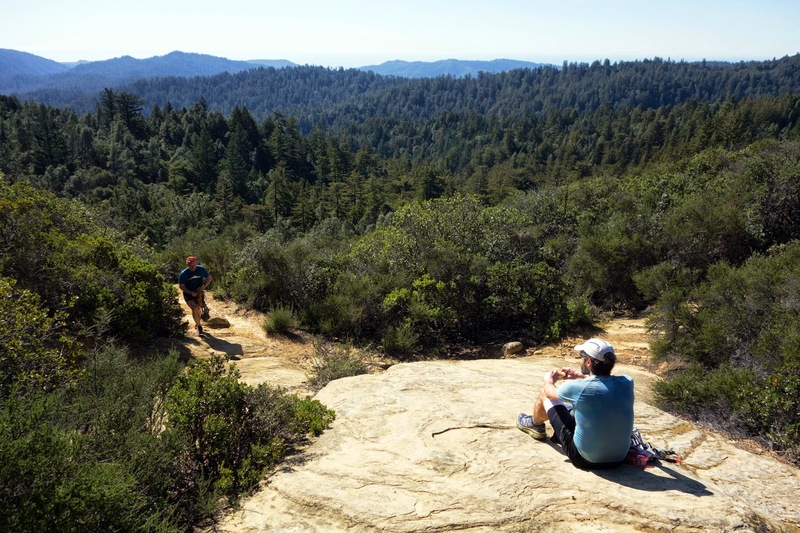 Steve and Beat wanted to get in one last long run before the ITI, so we set out for a fantastic 50-kilometer loop starting near Saratoga Gap on Sunday. 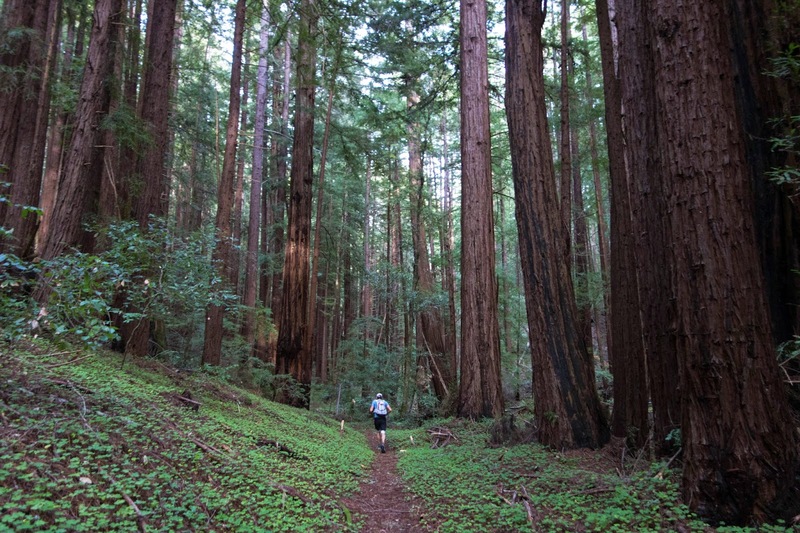 This route follows loamy trails through a series of parks above Pescadero Creek, rolling along grassy ridges and shaded redwood forests. With the exception of a handful of road crossings and a short jaunt through the campground at Portola State Park, it's all dirt and about 95 percent singletrack. I was quite excited for this run, even with my previously mentioned 15-percent chance of actually getting into the event I'm supposedly training for, the White Mountains 100. 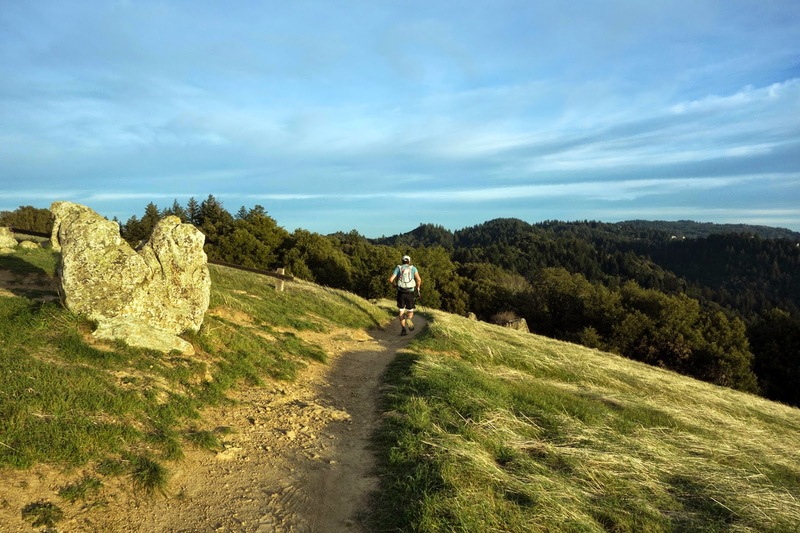 Even still, I signed up for the Montara Mountain 50K next weekend, which means three 50K runs in three weeks. It's all good training, but if I wanted truly useful bike expedition training, I would go push my fat bike up hills. I actually did this on Wednesday, riding Snoots to the Table Mountain Trail and engaging in a truly awful push, gaining 2,000 feet of elevation with gooey mud collecting on the tires, baking temperatures in the shade, and seemingly hundreds of black flies swarming in my face. I spun over to Sanborn for a swoopy fun descent on the John Nicholas Trail, but it was not enough swoopy fun to repair my disillusionment about pushing my bike here in muggy California. Aw, running is good training too. Back to the Pescadero loop. Temperatures climbed into the low 80s on a breezeless afternoon. I'm not the best in heat when I'm acclimated, but in mid-February when I'm trying to prepare for Alaska adventures, summer weather comes as a particularly unwelcome challenge. Humidity was relatively high and we were all drenched in sweat less than a mile into the run. We struggled to keep our core temperatures down with sips from a three-liter bladder of water that needed to last, because there was only one reliable water stop along this entire route, at mile 23. Steve came down with stomach problems early, and occasionally needed to sit down on the trail when he became dizzy. Several of these trails are not all that popular with hikers and off-limits to cyclists, which means they don't see much maintenance. Recent wind and weather events left them battered, with frequent large downed trees, piles of twigs and branches strewn about, and several inches of dried leaves covering all manner of foot-catching obstacles. Beat declared the soft carpet of leaves to be "good Alaska training." I found the conditions to be mentally taxing, although engaging. Even walking was tricky at times, and running at all meant having to think fast, because I stumbled frequently. The heat and technical trails forced us to keep the pace slow, which was good for legs that were already tired from a fairly ambitious week of training. I actually felt pretty good for most of the run, despite the withering heat. I love to visit these tranquil forests of the Santa Cruz Mountains. I plan to keep the White Mountains dream alive with one more week of aggressive run training, before I switch all of my focus to preparing my mind and gear for the coast tour. Every so often the thought pops into my head that this Unalakleet to Nome ride is something I'm actually going to try, which is ... unsettling. Especially when these thoughts come as I placidly walk to the store beneath the hot February sun. "It might be a hurricane of ferocious cold. I have not even the remotest notion of what that's going to be like." But these dreams — dreams of intense experience and renewed perspective — are what keep me battling the encroaching gloominess of change, and what keep me striving through the endless summer. You're having summer and almost out of water. In New England it is current -8 degrees and has been this way for about a month and Fairbanks barely gets below freezing every day. On Mt Washington, on Sunday, it was -35. The second coldest place on earth. Another reason I'm glad I'm semi old. I got to experience lots of real winter and life before social media. *though I love blogs. We don't have winter here either this year and live above the 45th parallel. We totally skipped winter in Western Washington. We went hiking at 5000 feet with no snow in sight a couple of weeks ago. On Tuesday we snowshoed (around patches of bare ground) above 6000 feet on Rainier and got so warm we had to strip down to t-shirts and could have comfortable worn shorts (and this wasn't even during an inversion). Crocuses and cherry blossoms have been blooming for a month. Our local weather guru says this is how our winters will likely be in 2070. No winter here in southern Utah here either. It's been a beautiful couple of months though I'm worried about a rough summer. I'm madly in love with all the scenic pictures on your blog.